Around the start of the year, I created a theme for Webmin designed to make it easier to access from mobile devices like smartphones and cellphones with simple built-in browsers. At the time I had a Treo 650, which had a very basic browser – certainly not powerful enough to render the standard Virtualmin or Webmin framed themes. 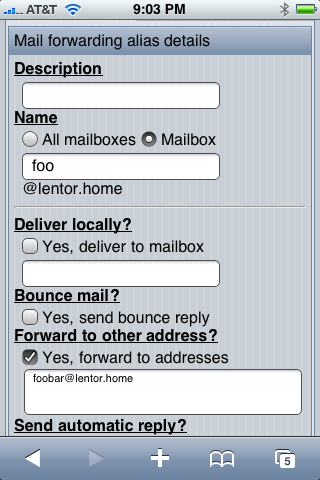 This was released in the virtual-server-mobile theme package version 1.6, and all was good in the world. Anyone using it could now access all the features of Virtualmin from a very basic browser, and read mail in Usermin without having to rely on the awful IMAP implementations in most smartphones. Then I bought an iPhone. Any HTML can go here. The index.cgi script is able to fetch all Webmin modules and categories with the functions get_visible_module_infos and list_categories, which are part of the core API. It also fetches Virtualmin domains with virtual_server::list_domains and global actions with virtual_server::get_all_global_links. Other pages within Webmin are generated using the regular CGI scripts, but with their HTML modified by the theme. This is done by overriding many of the ui_ family of functions, in particular those that generate forms with labels and input fields. Because the iPhone screen is relatively narrow, it is more suited to a layout in which all labels and inputs are arranged vertically, rather than the Webmin default that uses multiple columns. The label and value variables are the field label and input HTML respectively. The actual styling is done using CSS classes that were added to IUI for the theme. The same thing is done in functions that render multi-column tabs, tabs and other input elements generated with ui_ family functions. The only downside to this approach is that not all Webmin modules have yet been converted to use the functions in ui-lib.pl, and so do not get the iPhone-style theming. However, I am working on a long-term project to convert all modules from manually generated HTML to the using the UI library functions. In most Webmin themes, there are links at the bottom of each page back to previous pages in the heirarchy – for example, when editing a Unix group there is a link back to the list of all groups. The toolbar CSS class contains the magic attributes needed to position it at the top of the page, even though the theme outputs it last. We’re holding a logo contest over on SitePoint. We mentioned it in an article a few days ago and since then it has become the most popular contest running right now on the site! Awesome. That’s the good news. There’s also great news: The designers entering the contest are really good! There’s at least half a dozen designs that we’d be proud to call our logo, and at least a dozen of the designers are folks I would love to work with in the future. Hundreds of entries would do us no good if they all sucked, but these guys are doing really solid work. We’re about 30 hours from the end of the contest, so I wanted to post a summary of the work so far, and offer some advice to the designers, as well as offer up our thought process on why we like the logos that we like, and a few for logos we want to like, but don’t, and why. This is, by no means, an exhaustive list. For that you’ll need to check out the contest itself and the feedback on each of the entries. We’re an Open Source project, so super corporate looking logos probably aren’t right. We’ll be printing T-shirts, so too much complexity is a negative. Costs more to print, and looks stupid when screen-printed. It also leads to a weaker brand image…takes a long time to remember a really complex logo, but a simple one can stick on first or second viewing. Colors aren’t set in stone. We’ll have the SVG vector version, and can change the colors, as needed. Though poor color choices might indicate a lack of skill on the part of the designer, and we might be wasting our time trying to guide them towards perfection if the logo has problems other than color. I’ve noticed some of the designers take advice much better than others. Some of these folks are pros, while others are well-meaning amateurs, and one of the things that separates the pros from the amateurs is an uncanny ability to read my mind. We aren’t going to miss out on a great logo just because it is by an amateur, but we’re also going to choose a perfect execution of a good idea over a mediocre execution of a great idea. Be gentle, and have fun. We’re encouraging everyone to get involved, so we’ve got a few entries that are, frankly, not great. You can be harder on an entry that you really like a lot, because it’s easy to soften the criticism with praise. But, if one of us picks something that another hates, be gentle in vetoing it. Jamie has veto power (we all do, but Jamie really does). It’s his baby, and he gets to say no to any logo, no matter how much one of the other judges loves something. This is a bunch of logos that Jamie or I loved. Kevin is reserving judgment until the end, so we’ll have to wait for the professional opinions, but here’s where we stand, right now. This is definitely not an exhaustive list of the good to great logos in the contest, but it’s the ones that we picked out as being our favorites. Some of these won’t actually be going into the final round, due to a veto by Jamie or I, but these are all great by either my estimation or Jamie’s, so they’re worth commenting on. I like everything about this one. The spider web is clearly a spider web, it feels kinda like the Pentagon of spider webs: a place where Serious Internet Business takes place. The font is fun and the colors are soothing and modern. It scales small and large with no loss of impact and handles limited colors like a champ. Jamie also likes this logo. He’s unsure of hanging on to the spider or spider web branding of the old Webmin logo, so many of my favorites are in limbo (most of my favorites are spider related). But the strength of this logo won Jamie over, and he’d be happy with this concept. I love this spider! Every time I see it, I like it more. It’s got real personality, and with only one color. It looks great in any color, and even with fonts I don’t care for, like the one in this particular instance. Some of the other variants of this logo have better fonts, but miss out on the purity of this one. I like the single color, and I like the square spider icon better than the later instances that round the spider or add more colors to the Webmin text (though other instances do have better fonts). Haetro has a great sense of style and a minimalist approach that I find very appealing. Unfortunately for me, and for this design, Jamie vetoed it. The white space is pretty deeply offensive to him, and when scaled up he finds the spider frightening (I can see that…the eyes get really scary when he’s big). That said, Haetro is among the best designers in this contest, and I hate that none of his entries will make it to the final round. So, an interesting lesson to learn from this is that perhaps some of the most compelling images can also be the most off-putting. I asked around about this one, and it’s a very polarizing logo, you either love it or hate it. This one is out of left field, and that’s a big part of why I like it. It’s unlike any other entry, so far, and gets bonus points for that originality. The feel I get from the green blocks in the center is clearly “look at these modern server racks filled with systems doing Serious Internet Business”. And the big fat WEBMIN sitting on either side makes it real clear who’s in charge. It’s simple, clean, clearly relevant, reduces nicely, and looks good. Steve’s entry prior to this one is really nice, too, and in fact, Jamie likes it better. Steve has done some revisions of that idea, which Jamie and I both like better, so it may find its way into the final round. Interestingly, while Jamie and I both like Steve’s sense of style, we diverged on which of his designs we like best. But, at least one of Steve’s entries will be in the final round. Awesome execution on the idea of a spider built from the letters W and M. This is a gorgeous illustration. I wasn’t so sure about highendprofile’s skills based on his first entry, which was a nice idea but not very well executed, but this spider immediately blew me away. Beautiful execution and the spider is among the best illustrations in the contest. I don’t love the font on this one–it’s a bit tall and thin, but the colors are nice, and the spider is what draws the eye, so even with a not quite right font, I really like this logo. This is another of the spider-based logos that has gotten the axe by Jamie. In this case, the cuteness that I love is a turnoff for Jamie. It won’t, unfortunately, make it into the final round, but highendprofile is a great designer, and I wish we had another idea or two from him in the contest. What a champ. Give demonhale an idea and he runs it all the way in. This is a great spider illustration. Cute and shiny, very modern, very friendly. The font looks spidery, and the whole thing just screams “New Technology!” Great color choice, but color isn’t necessary for this one to look good. I like that the spider is hanging by a thread…perhaps going some place new. And, who doesn’t love shiny things? Jamie, surprisingly, did not veto this spider. It’s shiny and serious enough to pass the “is it too cute?” muster, and it’s also a really simple design. The colors are subdued and the execution is clean. So, shiny spider is going to the final round. This is another nice idea, that breaks from the old spider web and spider tradition. A box built from the letters W and M, with a nice solid font and cool colors. It’s quite pleasant to look at, and has some relevance for what Webmin does. Boxes don’t have a lot of personality…but it looks good nonetheless. It degrades nicely, and makes for a good favicon and icon version. Jamie doesn’t love the colors here, and I have to agree. Orange and blue have a feel that is distinctly non-high tech. But joswan is an excellent designer, and does really nice work, so we can probably chase him into getting the colors right. This designer has submitted nothing but great entries, but this is my favorite. The WM here is subtle and pleasant, the Webmin is bold and distinctive in red and gray. Nothing says Serious Internet Business like some sturdy red text. A stylized WM doesn’t mean much, but it sure looks nice as hell. It feels like it’s got the weight of Webmin’s ten year history behind it (ten years in Internet time is like 20 generations, so this is kinda like a family crest or family plaid to represent the Webmin family of products for the next 20 generations, or more). This is a very distinctive logo. Jamie found this one a bit boring, but likes some of ulauts other work. We might end up pulling another of his logos into the final round, instead of this one. This designer came out of left field with this one. It’s his only entry, but man did he ever knock it out of the park! Jamie and I both like this one a lot. The bubbly WM is just very pleasing and it feels familiar in a good way. I trust this logo. It feels kinda like a lifeguard. And, I can even kinda see one swimmer being helped to shore by another, now that I try to figure out why I think “lifeguard” when I look at it. So, dumples, has swept in with one lone entry, and found himself as a shoe in for the final round. You don’t have to do lots of entries, if the one you run with is great, and this one is great. Another one that Jamie and I agree on. We like the subtle use of color here, and the lovely dark gray Webmin in a round and friendly font. The infinity shape doesn’t mean much in reference to Webmin, except maybe that there are seemingly infinite things Webmin can do, but it looks good as hell doing it. I can picture this on great looking T-shirts (that cost an arm and a leg to print, because it requires shading to look this good), and it really shines on the web. Jamie likes the colors and sturdiness of this one. But it’s one that I vetoed. I’m not wholly aghast at the “WM as castle or rook” idea, but this execution feels like a logo for a BBS from the 80s. I think I broke several federal laws in order to call that BBS for free when I was thirteen. Jamie might have fond memories of calling that BBS, too, and that may be clouding his judgment. So, this one won’t be in the running, but another of rust3dboy’s logos will be, as we both really like most of his ideas…in particular the next one in the list. In general, a great designer is one that can produce numerous really great logos, and rust3dboy has done that. We don’t all love all of them, but at least a couple of his entries are among our favorites. This is another good, abstract “it’s a W and an M!”, concept, implemented by a real pro. I like the color symmetry here, and the WM looks kinda like a flag (I’ve always thought people who have a Black Flag tattoo are super cool, and this looks kinda like the Black Flag logo). Nothing to complain about here. This is another the both Jamie and I really like. The colors are beautiful and professional. Very modern feel all around. We have no clue what those dots and lines are all about. It’s like they’re being dropped into a shredder or something, or maybe it’s a wood chipper and those are the chips flying out. I think my favorite thing about this one is actually the colors, and the really professional execution rather than the idea itself. It just looks really clean. BeeOsx is a really good designer with some interesting ideas, and I suspect at least this entry will be in the final round. So those are the ones that bubbled to the top in the first round of discussions. Except for three or four vetoed entries those will definitely be considered in our final round of judging. There are a few that have come up since we had our discussion a couple of days ago that deserve special mention, as they are interesting new entries. This one is nice and subtle. I have no idea what the waves mean here, but they look awesome, and the color scheme is amazingly pretty. The font is a bit squat, but otherwise this is a great, simple, idea executed brilliantly. I’m going to unilaterally pull it into the final round of judging, but it may bounce right back out if Jamie or Kevin veto it. This designer showed up after the first round of judging, so he missed out on getting feedback from Jamie, but I think at least two of his designs are final round calibre entries. Another by the same designer as the previous one. If we’re going to go with a new mascot, rather than a spider or web, butterflies would be a great choice. This illustration is lovely and simple, and looks great in all sorts of colors. This is the other entry by Steve that Jamie and I both liked, but had some reservations about during early discussion. Steve touched up the problem spots, and now it looks pretty darned good. Definitely a contender. This is another early entry that we had some reservations about, but the designer cleaned up those problems, and now it looks really good. This one takes such a different route on color scheme that it’s notable for that reason alone. What’s your favorite logo, so far? Any gems we’ve missed that you think ought to be make it into the final round? Let us know! This is the future of Webmin’s branding we’re talking about here.